When organizations are less willing to give pay rises, perk (ifml. )(Sonder-)Vergünstigungperks and benefitZusatz-, Nebenleistungbenefits become increasingly important and can compensate for lower remunerationVergütungremuneration. These benefits may include crèche facility (UK)Kinderkrippe, -betreuungseinrichtungcrèche facilities, cycle-to-work schemeProgrammschemes enabling employees to hire or buy bicycles at preferential rates, season ticketZeitkarteseason ticket loanDarlehenloans for public transport, so that employees can benefit from yearly season ticket prices without paying everything at once, subsidizedsubventioniertsubsidized canteens, and free food and drink. Many employees also welcome the opportunity to organize their working hours around their lifestyles. Benefits such as flexitimeGleitzeitflexitime, TOIL (time off in lieu) (UK)ZeitausgleichTOIL (time off in lieu) arrangements, duvet day (UK, ifml. )(vom Arbeitgeber tolerierter) Abwesenheitstagduvet days, unlimited holiday and sabbaticals can also be welcome perks. Organizations don’t offer benefits out of the goodness of their hearts, however. A good benefits packageLeistungspaketbenefits package can be a means of expressing thanks for good staff performance, can increase employee engagementMitarbeitereinbindungemployee engagement, reduce staff turnoverMitarbeiterfluktuationstaff turnover and ultimately save money by avoiding the need for a regular pay rise. Managers may also enjoy company cars, private medical or dental insuranceVersicherunginsurance, or a company pension schemeAltersversorgungpension scheme. Luxury cars with higher emissions are often taxed more highly, however, and are no longer the status symbols they used to be. One sector that has always had fewer benefits is the hospitality and service industryGaststätten- und Dienstleistungsgewerbehospitality and service industry. One of the few benefits that staff have traditionally enjoyed is tips. This practice is dying out, however, as more and more customers pay restaurant and bar bills by credit card and contactless payments — and are no longer rounding up bills or leaving some money on the table. Some employers even include an amount for tips in their staff’s hourly rate, with the result that they effectively pay below the minimum wage. The modern trend of contactless payments has even spread to street performances. At the 2018 Edinburgh International Festival, people were able to “to tap to tipetwa: (jmdm.) bargeldlos per Handy Geld gebentap to tip” using technology provided by Swedish company iZettle (owned by PayPal) rather than leaving coins in a hat. Expand your vocabulary with these terms relating to pay and benefits. Select a word to see its translation and add those words that you want to learn to your vocabulary list. to subsidize sth.etw. subventionierensubsidize sth. 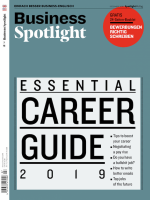 Dieser Beitrag stammt aus dem Magazin Business Spotlight 7/2018. Die gesamte Ausgabe können Sie in unserem Shop kaufen. Natürlich gibt es das Magazin auch bequem und günstig im Abo.